Do you avoid workouts with push-ups because you can’t do a single push up? All that will change once you complete the push up challenge below. This challenge will strengthen the muscles used to perform push-ups. To perform push-ups properly, you need strong arms, shoulders and core. 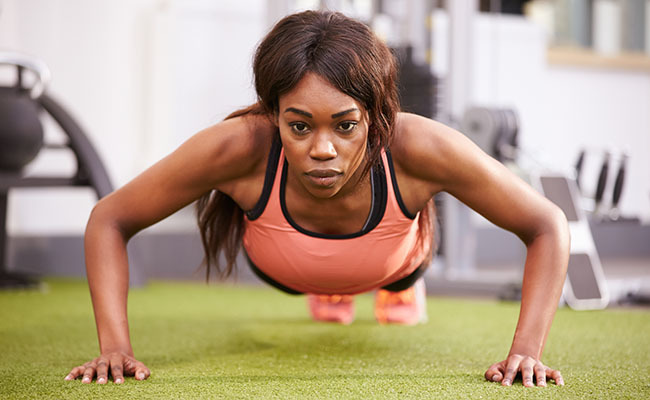 Doing push-ups regularly will make your upper body strong and toned. The 4-week challenge: This challenge has weekly workouts with 2-3 exercises. These workouts should be performed 3 times a week. It’s important to maintain proper form when doing these progression exercises. Note that it might take you longer than 4 weeks to get better at push-ups if you don’t stick to the recommended number of reps.
Take one minute rest between sets. If you don’t know how to perform some of these exercises, click on the links below the infographic for demonstration videos.